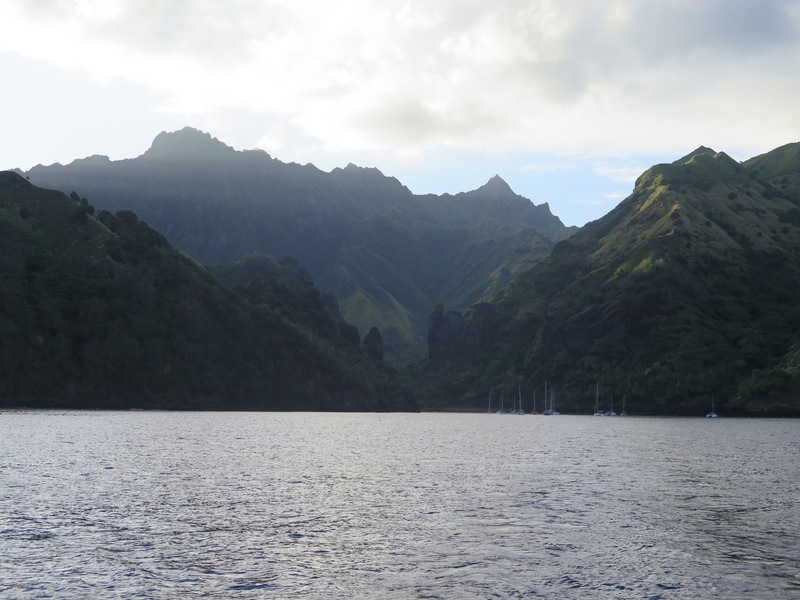 At 6 am Thursday we weighed anchor reluctantly and sailed the 42 miles northwest to Atuona, the port of entry on the island of Hiva Oa. 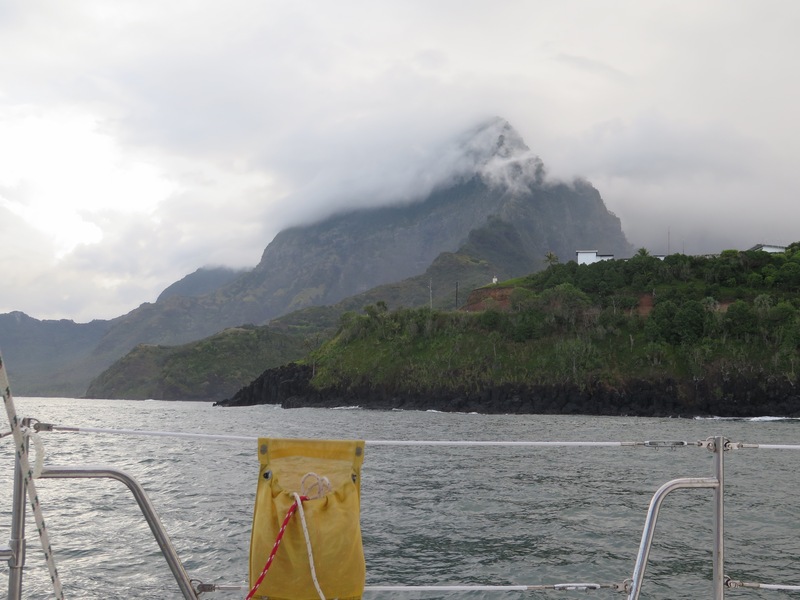 As we rounded the tip of Fatu Hiva we caught a perfect breeze of 12-15 kts and raised sail. About two hours later a nasty squall appeared out of nowhere and we were suddenly in 30-35 kts, the highest wind we’d seen since we left El Salvador. We hung on for the better part of an hour while EV just cooked along, and true to form, when the squall passed it took the wind with it. We motored for a while until the breeze built back up to about 10 kts, then motored when it dropped again. The whole day went like this, motoring for 1/2 hour, sailing for an hour, motoring again, sailing again. We approached the island at about 3 pm and were looking forward to getting the hook down, walking into town to get some cash and spending the evening eating pizza on shore. But it was not to be. Just as we were dropping the sails and preparing to enter the harbor the coast guard piped up on the radio and announced that a French warship would be arriving in Atuona about 5 pm and until that time all boats were requested to remain outside. Thank you for your cooperation. Rats. 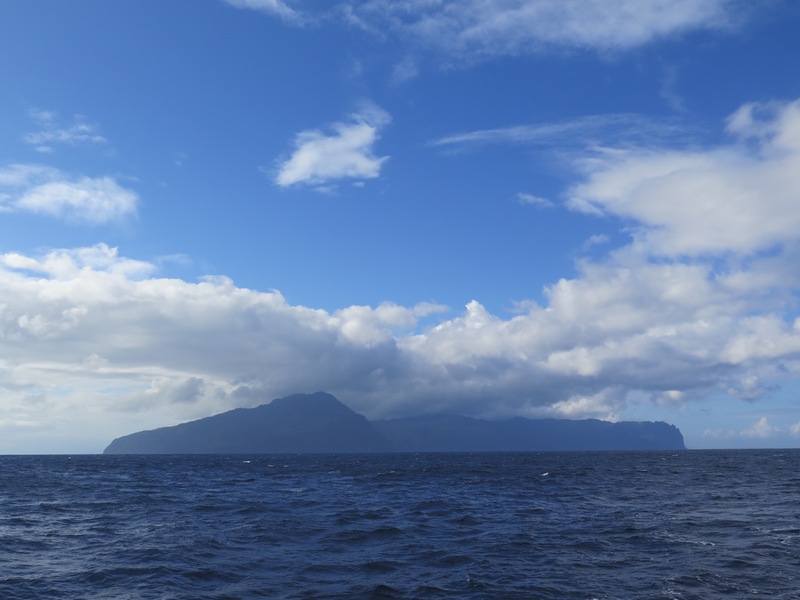 Atuona lies in a small bay that faces the prevailing wind and swell. There’s a breakwater that mitigates the motion somewhat but we were being asked to stay outside the breakwater in an extremely rolly patch of water with waves breaking over the rocks behind. As we motored in we saw there were already 5 or 6 boats crammed into the space. We picked our spot and were discussing our strategy for securing the boat when a big funky ketch zoomed up behind us and ran right for the only open space we could see. Jerk. We found another spot and while I maneuvered EV into position Jack ran forward to drop the anchor. I’ve never seen him work so fast. We had to get hooked quickly before the swell knocked us sideways, and as always when anchoring, we have to judge the complicated geometry of water depth, chain length, other boats’ anchors, wind direction and possible shifts in direction. After three years we’ve gotten pretty good at it and EV came to rest perfectly spaced between two large monohulls. Two more boats came in behind us and both of them made multiple attempts before getting settled safely. Jack and I think this is the most violently rolly anchorage we’ve been in since the Hudson River at Nyack, NY, back in 2012. Even Santa Cruz in the Galapagos wasn’t nearly as crazy as this. Suffice it to say by the time we got settled there was no way we were leaving the boat, so it was another “can night” where I’m challenged to make dinner using what we have on the pantry shelves. Soup, I figure, with the last of our potatoes and carrots, corn and chard from the freezer and broth and canned tomatoes from the pantry, along with fresh-baked cheese biscuits. Not exactly pizza but adequate. We really need to get some groceries. In about an hour we’ll have the fun of launching the dinghy and bounding through the waves to shore to begin the check-in process. Then we can hit the ATM and buy some groceries. Yay!